Guest Blogger Week: Day 1: Deirdre’s Review of Essence Cosmetics! I’m Deirdre from Not Just Makeup and I’m really happy for the great opportunity that Molly has given me to write on her blog and “meet” all of you guys. She told me that she has never tried Essence Cosmetics and I thought it would be nice to share my experience with this brand. But first, a few things about the company: in 2012 Euromonitor International named essence the “Europe’s no. 1 cosmetic brand!”. If you go to the essence website you can see all the countries they sell their products in and all the stores that are nearest to you. 2. their products are really cheap but qualitative because they don’t pay ad campaigns or expensive models. – Essence Make Me Brow Gel Mascara in 02 Browny Brows – I didn’t try the Benefit Gimme Brow but people say this Essence product is a perfect dupe and I can see the resemblance: the packaging looks very similar, they both have a small brush that’s easy to use and they both have fibres to help your eyebrows look fuller and more natural. For me, this shade is a bit dark but I can get away with it. Overall I like this product and it looks great on its own or on top of powder. 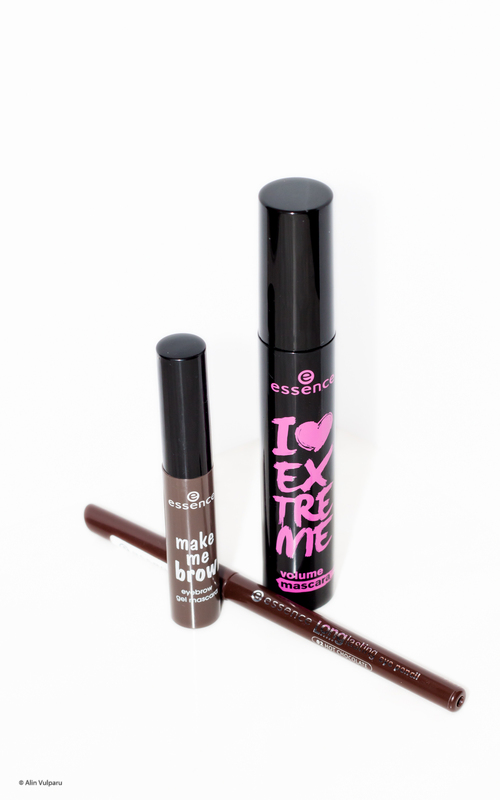 – Essence I Love Extreme Volume Mascara – I bought this mascara because I heard great reviews about it. To be honest, I only tried it out a few times and, as most mascaras are for me, it’s a bit too wet for my lashes. If I’m careful when I’m applying it, it looks great – offers both volume and length, but I want to wait a few more weeks for it to dry out more and see its full potential. I’ll make sure to make a review of this product on my blog. – Essence Longlasting Eye Pencil in 02 Hot Chocolate – this eyeliner is supersoft, offers great precision for application, lasts well thought the day and it’s ideal for a more natural look. So I would recommend this product! 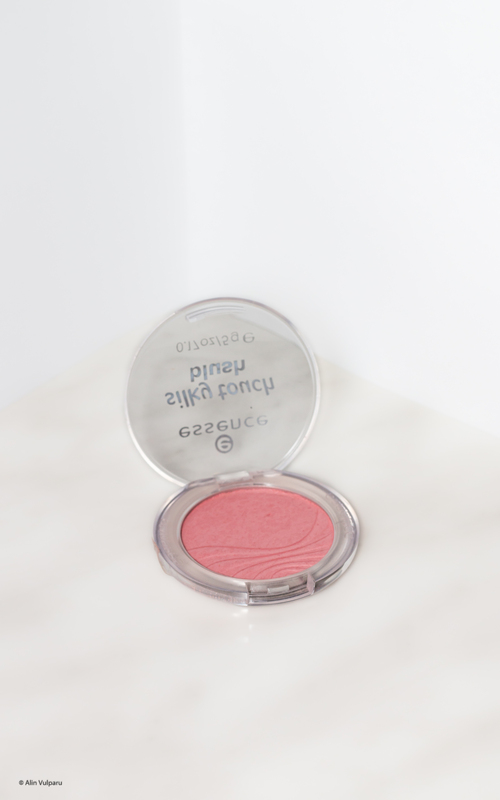 – Essence Silky Touch Blush in 10 Adorable – it lasts up to 10 hours on my cheeks and it gives a nice and fresh look to the skin. A friend of mine told me it’s a dupe for Benefit Dandelion, and for what I can tell from the swatches on the internet, they’re pretty similar. – Essence Match 2 Cover Duo Concealer in 10 Natural Beige – honestly, at first I didn’t like this product at all. I thought it was too heavy for my undereyes and it looked like it was just sitting on top of my skin. A few months ago I wanted to part ways with it but I wanted to try it out one more time just to make sure it’s not worth keeping and… surprise! It’s the best concealer I’ve ever tried. Then I realized the reason why I didn’t like it at first was because it was winter, it was a bit too cold in my house at the time and I wasn’t patient enough to warm up the product between my fingers. As you can see from the picture, I like this product a lot and I intend to repurchase it as soon as it’s gone. – Essence Longlasting Lipstick in the Shade 03 Come Naturally – I like the shade of this lipstick, especially for the colder months, it has a nice and creamy texture, the product lasts well on my lips, fades nicely (doesn’t leave that gross-looking line around the lips) but it has a weird (old) scent. So I would suggest you smell it first and then decide if you want to buy it or not. – Essence Lipliner in 05 Soft Berry – I think this is one of the best lip product I’ve tried so far. I love the color, I love the texture and its ability to stay strong after several hours. It goes smoothly on the lips and once it’s locked into place it will stay there. You can kiss and eat with it on, but I’d advise you to drink only from a straw and not eat anything oily if you don’t want the color to rub off. – Essence Minis 2 Go Travel With Me – I just wanted to buy some travel containers and I thought these were cute. My boyfriend was kind enough to buy them for me when he was on a business trip in Germany and all I can say is that they do their job (I tested them only in a car): they’re small, travel friendly and I think you can fit a lot of product in 30 ml. – Essence Studio Nails – Nail Polish Corrector Pen – I’m awful when it comes to nail polish application. I’m never patient and I always manage to smudge my nail polish. Fortunately for me, a friend of mine told me about this wonderful product. It’s acetone free and it has 3 replacement tips that erase the mistakes with precision. It’s recommended to clean the tip with tissue to prolong its lifespan. When I’ll run out of this one I’ll definitely buy another. – Essence Quick Dry Top Coat – first of all it does what it says: it dries your nails faster. I wouldn’t say instantly but it’s better than having to wait for them to dry out by themselves. As a top coat, I can say it does its job – it prolongs the nail polish you have on, but don’t expect miracles from it. – Essence Duo Sharpener – for a long time I thought these types of products were just another way for companies to steal your money, but I was so wrong. I can’t tell you how many lipliners and eyeliners I ruined just because I was stubborn and I continued to use a regular sharpener. I’m not telling you to buy this one, necessarily (although at the price of 1 euro I don’t think you can do better), but I’d recommend you to invest in this type of product. – Essence Smokey Brush – I mostly use it to do a cut crease or to smudge out eyeliner with this brush and so far I like it – I have washed it lots of times and its bristles didn’t fall out. – Essence Kabuki Brush – this brush doesn’t leave my bag. It’s perfect for touching my makeup up when I’m on the go or for traveling and it works great with powder or blush. I just love it! PS: For most products, the packaging is cute but the quality isn’t the best (which is expected considering the low prices), so be careful if really sturdy packaging is what you need. Over all I think the Essence brand has great quality for really low prices. That’s all from me guys. Hope you’ve found this article interesting or at least you enjoyed reading it. Make sure you come back tomorrow for part 2 of Guest Blogger Week here on The Rose Beauty Files! Guest Blogger Week & 100 Posts! Guest Blogger Week: Day 2 : Nicola Does My Makeup! Me too 🙂 I love the color and how much it lasts on my lips. I’m glad you changed your mind. I’m always happy when I find cheap products and great quality. A Trip to Burleigh's Gin Distillery! Review: Makeup Obsession Customisable Palettes! My Experience With The Magnitone Lucid!